Vesta is “peppered” with carbon materials which researchers believe were left behind by asteroids gently striking its surface. 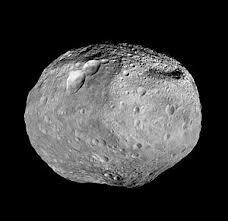 Vesta is an asteroid itself – but one so large that some astronauts were actually thinking about declaring it a planet, or at least a protoplanet. It is the second largest asteroid in our solar system, second only to Ceres, comprising 9% of the total mass in the asteroid belt. This year, Vesta has been studied in detail by the Dawn spacecraft. It is actually the first evidence astronomers have about asteroid material across a large body’s surface, and it could explain the curious patterns observed by Dawn, which orbited Vesta from July 2011 to September 2012. “The earliest images we had of the surface — shortly after going into orbit — were sometimes spectacular examples of very bright and very dark material on the surface,” said researcher Tom McCord of the Bear Fight Institute, a science research facility in Washington state. McCord is the lead author of a study reporting the findings that will be published in the Nov. 1 issue of the journal Nature. They had three initial theories regarding the dark coloured patterns: they could either be volcanic basalts which are typically black, they could be “shock-melted and darkened” material melted from the surface heat caused by impacts, or it could be carbonic, primitive organic material. The light spectrum analysis revealead that the black matter came off of asteroids, and that it also contains lots of hydrogen and hydroxyl in the materials, which tends to be present in carbonaceous asteroids.